This is an updated version of Heritage Highway below, including all buildings and cemeteries etc that are included in the 2011 provincial inventory Inventaire du patrimoine bâti de la région de lOutaouais, or the 2003 Inventaire des lieux de culte du Québec. Heritage highway, the scenic route to the Pontiac. Route patrimoniale - maisons et églises patrimoniale de la municipalité de Pontiac (cantons dEardley et Onslow et villages de Quyon et Luskville) - Patrimoine pontissois. Desolé, texte seulement en anglais. Describes heritage buildings, and information for visitors from the start of Eardley Road in Aylmer, along Highway 148 in the municipality of Pontiac (before 1975, Eardley and Onslow townships and Quyon village), with interesting diversions along the old highway 8 through Luskville village, Taber Rd, and through Quyon village to Wyman. More information on Herdman (Hurdman) family. 1861 census data for Eardley and Onslow townships (pdf files, transcribed partially in 2009, ie not complete). for residents of the region and visitors. Reports of Pontiac council meetings etc, by Mo Laidlaw. 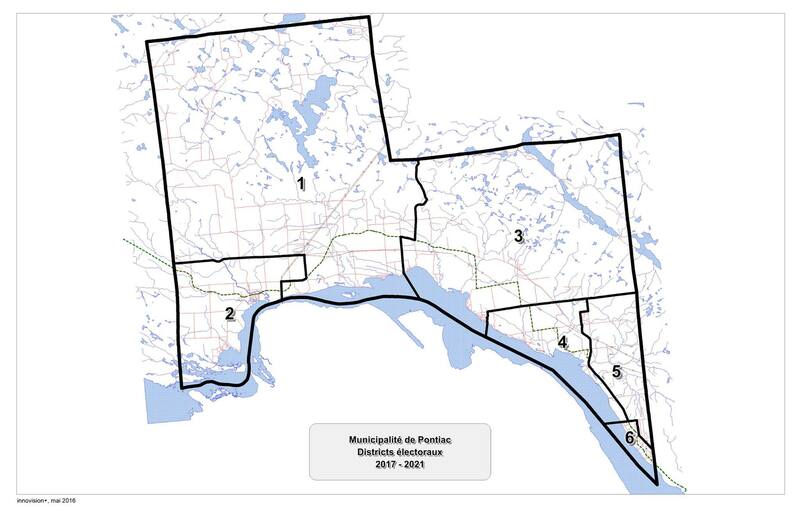 May 2016 map of electoral boundaries for January 2017 on. Action Pontiac on Facebook: news and information for residents, by residents. Articles on local history, farming, protecting the natural environment and local issues. Arbres notables / Notable trees - big trees, little trees, flowers, fruit, dying elms etc. Books about the area, heritage houses and early families. Joseph Mondion, Philemon Wright, Joseph Wyman, John Christian Mohr, John Egan, Walton Smith, the Prince of Wales, John James Muldoon and Douglas Humphreys Pimlott all played a part. Learn about Pontiac Village, the local churches, the Pontiac Pacific Junction railway, mining and the Quyon ferry. Gatineau Park. 61% of the park is in the municipality, including all the wilderness area around Lac La Pêche. 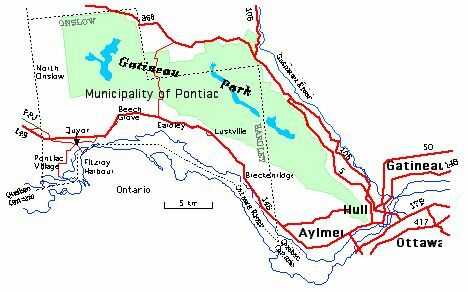 Statistics of the municipality of Pontiac. This 4 minute slide show takes you along the historic Aylmer road - from Symmes Inn (Aylmer) to rue Eddy (Hull), showing some of the older buildings and the generally green and attractive appearance of this route, as well as newer additions. Parts of the road now go by other names - boulevard Alexandre-Taché in Hull, and rue Principale in Aylmer. What are the traffic rules for roundabouts in Québec? Steamboats on the Ottawa River. Canoe travel on the Ottawa River.